Leigh Halfpenny shared the kicking duties with Rhys Patchell. ALEX CUTHBERT CONTINUED his return from a recent ankle injury to run the length of the pitch and score and deliver to killer blow to Glasgow Warriors Heineken Cup hopes. The Welsh winger intercepted a Warriors pass deep inside his 22 and outpaced the covering defenders to finally quell the Scots’ resistance. Leigh Halfpenny and Rhys Patchell combined for the remaining 24 points in an impressive 29-20 home win. Cardiff were 6-0 up after 20 minutes when Patchell bundled over from close range and won favour with the TMO. Halfpenny converted and added a penalty before Warriors’ Sean Maitland burst through a gap in the home defence to dive over. Halfpenny and Duncan Weir traded penalties after the break but Cuthbert’s lung-busting sprint ensured the win. A late try from Leone Nakarawa proved a mere consolation for the Scottish side as they left without a bonus point. Ospreys’ Heineken Cup challenge has been a meek one and though they showed some fight against Castres this evening, the French side were deserved winners. Rory Kockott landed four penalties and missed three others for the Top 14 champions in a 15-9 home win. Dan Biggar’s three penalties were all the Welsh side could muster in response. Ospreys, who lost their first two pool matches in October, pressed for a try in the closing stages but were denied by some cynical French tactics. Geoffrey Pais and Seremaia Bai were both sin-binned in injury time as Castres used some illegal tactics to prevent Ospreys from the score that would keep them afloat in Europe. Castres’ win places them level on points with Leinster atop Pool 1. The Irish side face Northampton Saints tomorrow at 6pm. Email “Halfpenny and Cuthbert guide Cardiff to Heineken Cup win over Warriors”. 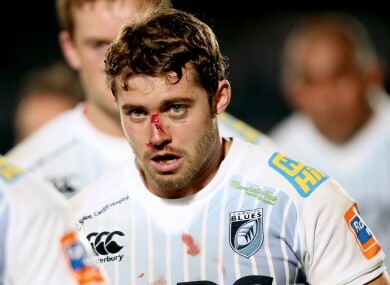 Feedback on “Halfpenny and Cuthbert guide Cardiff to Heineken Cup win over Warriors”.